Pub-crawl your way through the liturgical year with this light-hearted collection of cocktail recipes, monastic lore, Latin toasts, and recommendations on spirits, wine, and beer for every season! With delicious recipes from “The Monk” (Gin, Lemon juice, Benedictine) to “The Bonny Scott” (Scotch, Drambuie, Calvados, Passion fruit), this book is one part bartender’s guide and one part spiritual manual. Gave this to Grandpa as a Christmas gift. The book was full of interesting information and he loved seeing how the drinks coincided with the story of the saint assigned to that day. Very unique gift for someone who has everything. The information about the saints is written in a fun and informative way. 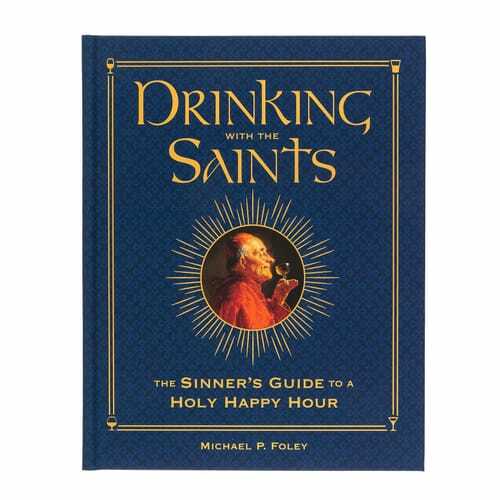 The author then matched the Saints with a variety of mixed drinks you can make at home to celebrate the feast days. We decided to give this highly entertaining book to our adult children for a christmas gift. No better way than great humor to rekindle and remind our children of our great catholic saints sacrifices to soften the path to eternity before us. We really love this well written book. Thank you Catholic company for what you do. I bought this as a Christmas Gift for my Catholic Priest this year, I know he will love this! We gave this book as a gift to my brother-in-law and he is fascinated with it. A little spiritual reflection and refreshment; looking forward to it! I am so glad I found this book. It will be a perfect gift for an Irish friend of mine. He enjoys his drink and will appreciate all the great information & illustrations that this book contains. I enjoyed reading about my favorite Saints and I know he will too! This was a gift for stepson who has an interest in monastery brewed beers. He loved it; couldn't put it down. Fascinating facts, includes recipes. It exceeded my expectations. It is a high quality, attractive hardback volume. I bought this with the idea of giving it as a gift. It is so excellent, though, that I am keeping it for myself! Beautiful edition--gorgeous hardcover, gorgeous interior--and the contents are fantastic. From the Introduction, in which the author shares some history, some insight, and reminds us of the importance of moderation in order to truly enjoy God's gifts he writes with humor and wit, sharing amazing recipes for the liturgical year. Have a cocktail, with the saints at your elbow!